Basically this is probably the best dining you’re going to get in South Lake Tahoe. I ordered the charred steak (well done) w/ ravioli and veggies and a chicken Caesar salad and garlic bread for an appetizer. The portions were generous. Everything came out in well-timed manner. The steak was juicy and crisp. The entire meal was DELICIOUS! even the chicken added was freshly grilled and still sizzling on my salad. The atmosphere is great, not the Best place for kids but hey, where is. Looking forward to dining here on my next Tahoe trip. Will be recommending this place. 7/29/2016 yelp! We were out-of-towners, looking for a place to eat dinner. It’s always difficult to know which restaurants will be good & which will be not so good. Well, Izabella is one of the great ones. First, let me comment on the service! It was – in one word – EXCELLENT! Glorianne (hope it’s spelled correctly) was friendly, able to make recommendations and made us feel like locals. Alex, a helper, was attentive and very mannerly! Next, let’s talk food. We started with the Bruschetta – the tomato and basil topping was mixed with a perfect amount of garlic. The bread was lightly charred, which added a nice smoky flavor and crunchiness to the bread. The balsamic glaze lightly drizzled over it added the perfect amount of tanginess to the appetizer. If we had been alone, my husband would have licked the plate. For the main course, we thoroughly enjoyed eating the Lasagna and Bucatini Puttanesca entrees. The lasagna was literally the most delicious blend of meat, ricotta, mozzarella & tomato sauce. And the Puttanesca, well, let’s just say it put all other Puttanesca dishes to shame. Finally, dessert. The Espresso Mud Pie was a perfect way to finish the meal. Thank you for a delightful meal and dining experience. Next time we’re in So. Lake Tahoe, it will be our first choice for dinner! 8/24/2016 yelp! Our family just went to Tahoe during Labor day. This place is very kids friendly. My son ordered the kid’s ravioli. Manu said have 3 but turn out is adult side of 6. My daughter ordered the meatball pasta also huge which I believe is adult size. Great value. The Marinara sauce come with the garlic bread is one of the best Marinara sauce I ever tasted. Wine selection also great. I am very happy for the wine our waitress recommended. Service is excellent! Definitely will come again when we are visiting Tahoe! 9/11/2016 yelp! You must try this awesome place. Great selections and great prices. Our waitress has been there for 5 years and was so pleasant and helpful in our selections. 8/6/2016 yelp! The appetizers were out of this world!!….. and it just kept getting better…and better! !… The Salmon!! 9/11/2016 yelp! My husband had the chicken piccata and I had the salmon special in beurre blanc sauce with risotto. Outstanding! Super fast and attentive service. One of the best salmon dishes I think I’ve ever had. Can’t wait to go again… 12/28/2018 yelp! We just walked past this the week of Christmas 2018, with snow on the ground, and decided to try it. Best choice ever. Eric, our waiter, was PHENOMENAL. Get whatever he recommends. The mushroom ravioli app is to die for, the house risotto I would fight someone over, spaghetti marinara is some of the best I’ve had, the New York Strip was a great quality protein cooked beautifully medium rare, the special, Salmon Oreganato, was a gorgeous piece of fish crusted with herbs and sauced in beurre blanc, and we had NO room for dessert. Oh, their wine recommendations are on point too. Just….eat here. And definitely get risotto. 12/22/2018 yelp! We had absolutely one of THE best dining experiences EVER at this establishment! Our waiter Erick was a delight and the chef even came out to greet our table! Do not hesitate to go to this place for their stellar food and wine menu!!! 12/09/2018 yelp! So, we were looking for someplace to eat and we are picky about Italian food. Who am I kidding? We are picky about all food! So we ordered the Salmon, the Chicken Marsala and the Chicken Parmigiana. It was PERFECT! The service was amazing (thank you Eric…you are awesome). They are only a few weeks old but they their food down. Congratulations, South Lake Tahoe, you just got another gem of a restaurant. 8/6/2016 yelp! Dorianee I hope I remembered your name right love, you were amazing. Thank you for a wonderful night. Come see us anytime, best wishes David & Elena, San Francisco 8/22/2016 yelp! The hostesses were charming, friendly and quick to seat us, without a reservation. My wife ordered the chicken marsala. I ordered the chicken piccata. Before the dinner arrived, we were given freshly baked bread, olive and balsamic vinegar. Both dishes were delicious, with the chicken perfectly cooked, a side of fresh vegetables and a perfect amount (a lot) of sauce. So much sauce, that we actually got more bread with our dinner, so we could use the bread to soak it up and clean the plates. 12/11/2018 yelp! My wife and I went in here because they shared a parking lot with the Holiday Inn Express, and we were too lazy to walk any further. We’re very glad we went in. We loved it so much, we returned the following evening. 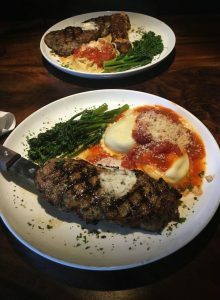 It’s an upscale Italian restaurant that welcomes the casually-dressed South Lake Tahoe crowd. The hostess and the entire wait-staff were first-class. The food and the presentation were fantastic. The background music was just the right volume so it created a great ambiance, but was not too loud. And even the padded booth seats were comfortable. 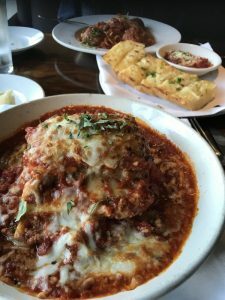 Between the two nights we had the lasagna bolognese, the eggplant Parmesan, the chicken saltimbocca, and chicken piccata. We agree with the previous poster, Roberta B This was one of the best Italian meals we have ever had. 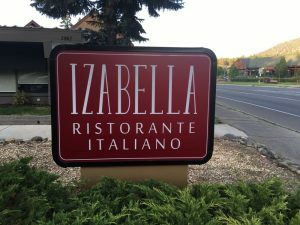 Izabella will be a great addition to the South Lake Tahoe strip. We will definitely return the next time we’re in South Lake Tahoe. We also highly recommend this new restaurant to everyone. 6/18/2016 yelp! Service, quality and cleanliness of restaurant all attribute to my 5 star rating. Very nice date night restaurant or family dinner. My daughter and I were craving pasta and this place did not disappoint. When we arrived I asked if service would be long as we had an 8:00pm show, we were seated, served and out the door by 7:20 (we arrived at 6:30pm). The garlic bread was delish! We are picky eaters but really enjoyed spaghetti and meatballs, and the lasagne. Next visit to Tahoe and we will be headed there again. 7/01/2018 yelp! 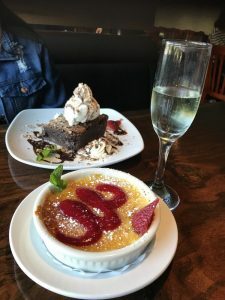 The caesar salad was delicious, garlic wine sauce in clam linguine was to die for, and the raspberry creme brulee was really good. The service was great too: our waiter was very prompt and courteous, and the food came out very quickly. Can’t wait to come back and try more dishes! 12/03/2018 yelp! The server was specific with the details of the items and explained them all well. The appetizers were excellent and they arrived promptly after ordering. The server suggested a wine to go with our varied meal selections and it was an excellent choice. 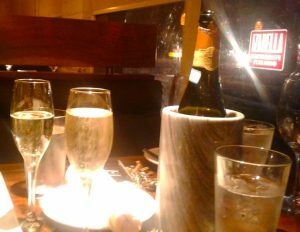 We were there Christmas Eve and enjoyed ourselves immensely. 12/27/2018 yelp! Great place for a special family dinner. Wonderful hostess and waitress. Food and service was excellent. Large portions and sumptuous desserts. 11/21/2018 yelp! Wow!!! Came to Lake Tahoe for my birthday and wanted a good Italian restaurant and found this place on yelp! 🙂 Saw it had very good reviews so we decided to give it a try. It was sooooo good. Food was amazing. Waiter was very nice. Highly recommend. If we ever come back, we will definitely make a stop here. 12/16/2018 yelp!